Recently I have mentioned how I was beginning a gluten free diet HERE. I have been doing a lot of research and have come across some great recipes that are not only gluten free, but delicious. 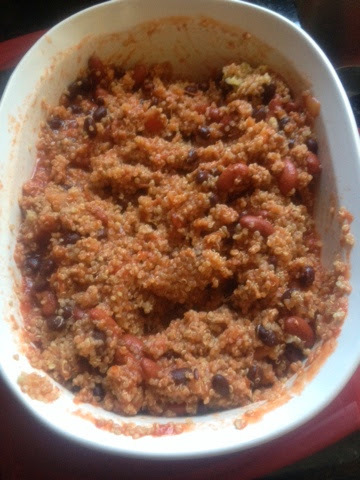 Out of all the meals that I have found so far though, one stands out to me the most that was shared by a co-worker of mine, turkey quinoa chili. I love the taste, it fills me up, and it is really great to make on a Sunday and have a whole bunch left over for the week to take to lunch or have for dinner. Just let it simmer for like 25 minutes or so and then add more spices as necessary. If you notice that it is getting a bit dry, add some chicken stock. Once done cooking spoon chili into a bowl. Top it with a little bit of cheese, a dollop of plain fat free Greek yogurt and you are good to go! Is this a recipe that you think is worth trying?